During the autumn we have formed an association with Swansea Museum Services that has resulted in a long term loan of a number of historic vehicles from their reserve collection, formerly housed at the Museum Stores in Landore. Following the closure of the former Maritime & Industrial Museum (MIM) in the Swansea Maritime Quarter, many of the exhibits were moved to Landore, where they remained available for viewing. That viewing option having long since ceased, discussions between both Museums were opened with the outcome that many of the transport exhibits can once again be seen by the citizens of Swansea and beyond. We are proud to have the confidence and co-operation of Swansea Museum over the loan of the vehicles and the increasingly close association of the curatorial staff. 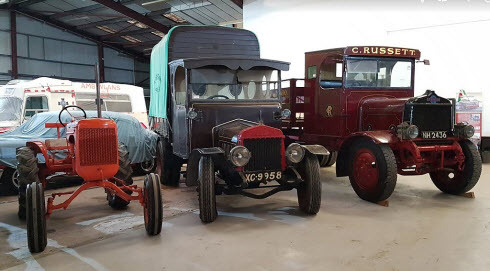 The new arrivals were carefully and kindly transported by Ian Davies Plant, and include a 1920 Vulcan Goods Lorry which that took part in the 1969 London-Brighton run, a 1919 AEC YC-type goods lorry, a 1943 Allis Chalmers Hill Farm Tractor, a 1951 Wolseley 6/80 Police car and a presentation-cased and chromed Transit rear axle from Fords Jersey Marine, the last ever produced at the former plant. A unique Neath Coachworks-bodied 1947 Leyland Tiger bus formerly operated by the Llynfi Bus Company for use on local valley routes arrived with us ahead of the remaining vehicles and in time for display at our October 28th running day. The two goods lorries are now to be worked on with a view to restoring them to full running order. Other exhibits will be added in due course, while similarly closer links are being discussed with a number of other transport heritage groups and motoring clubs. 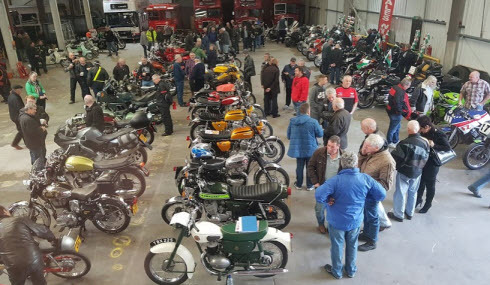 The inaugural Classic Motorcycle Show held at the new Swansea Bus Museum and Transport Heritage Centre on Sunday October 7th proved to be a big hit with both exhibiting riders and public alike. 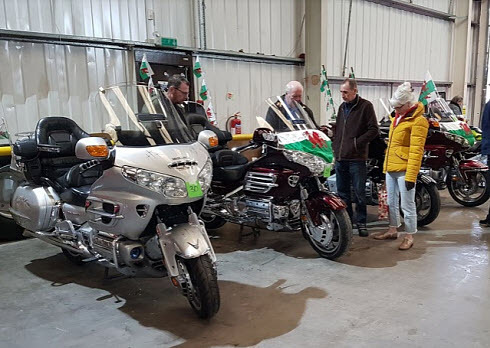 The main display area echoed to the sound of tuned racing machines, while the glittering splendour of the huge Honda Gold Wing machines brought to the venue by the South Wales Wings Club stood out. 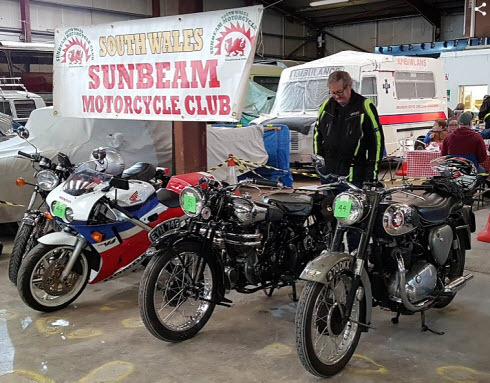 The Triumph Owners Club and the Sunbeam Owners Club were also well represented, both having stands and display motorcycles amidst the ranks of superb machines that attended from throughout the Principality. ‘Bikes of virtually every era, make and condition assembled, with riders expressing delight that the show had returned to the city. It had formerly progressed from a small gathering at the former Swansea Maritime and Industrial Museum in the Marina to an ever growing show overseen by the exhibitions team at the nearby Swansea Museum, the oldest Museum in Wales. That museum had not been afraid to take a step into the two wheel world, as well as presenting the history of the city to visitors. Having fairly recently ended that waterfront life, it is now hoped that the new show – supported this year by Mounts Motorcycles of Swansea and Port Talbot – will go on to be the annual fixture that it had established itself, as was felt by many of its peers, to be the best in Wales. From comments made by those attending this new show at the Swansea Bus Museum & Transport Heritage Centre it more than upheld that reputation in 2018. 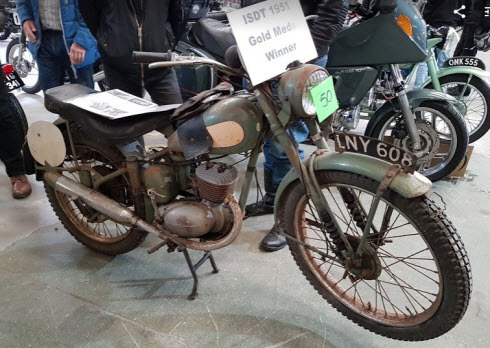 Some 90 machines were on display, ranging from such venerable bikes as the 1950’s BSA Bantam that was found in a neglected state by its new owner (pictured, right) and proving to be a factory supported International Six Days Trial machine - that must be a very rare survivor indeed. There were snarling racing machines that included the Phil Landeg of Swansea-owned Rob North Triumph Trident of 1972 vintage and the up to the minute British Superbike Championship Yamaha R6 of nineteen year old Welsh circuit racer Mark Clayton. The road bike entries were numerous and impressive, featuring a specially built 1973 Triton of Leon Sparks, other ‘café racer’ style machines including the gleaming yellow Norton Commando of Swansea’s Gareth Smith, the MotoGuzzi250TS of David Price and Kawasaki Z9 RS of Neath rider Deri Lewis, all bringing back memories of the famed ‘rocker’ years, as did a gleaming array of lamp bedecked scooters from Lambretta and Vespa, evoking the ‘Mod’ era. The yesteryears of the once mighty British motorcycle industry were well represented too, Edwin Thomas of Merthyr wheeling in his pair of immaculate Triumphs, a 1956 Tiger 110 and 1961 Trophy TR6, both looking as if straight out of the dealers showroom and probably even better! Added were Velocettes, a Venom model of Godfrey Benson another rarity , as was the superb Brough SS80 of Pontypridd rider Ken Baxter. The organiser's task of selecting winners from the cavalcade presented soon became impossible in the sense that so many of the machines were individually deserving of an award. Hard decisions had to be taken and regrettably some deserving winners were left out this time. The mighty Honda Goldwings were staggering in both size and presentation, a number featuring inbuilt ‘light shows’ that would do justice to the best of nightclubs, each and every one a potential prizewinner. The entry list had almost every make, BSA Road Rocket, AJS models from the 1940’s and later, the humble but immaculate Francis Barnet, a rare Douglas Mark 5 of 1951 vintage well restored and still ridden with enthusiasm by Bert Davies of Carmarthen, as was the 1927 Triumph ‘TT’, owner Colin Davies riding in from Ammanford despite the frosty morning start! The foreign bikes were also well represented with machines including the pristine Honda 250 four of Skewen MC rider Tony Olszewski , along with Italian exotica from Ducati and MV Augusta. Some of the worthy Award Winners – Dylan David, Edwin Thomas. Bert Davies, David Price, Alan Richards, and Colin Davies are pictured with Event Secretary Veronica Gale at the close of the show. The organisers are confident that the success will be built on for 2019 and beyond, encouraged by the enthusiasm of the riders and the visiting public for this returned fixture in the motorcycle world. 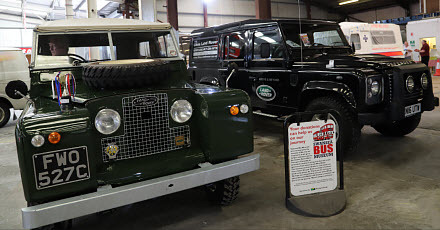 Our celebration of the seventieth year of Land Rover production, with a display of the unique four wheel drive machines at the Viking Way premises last Sunday, proved a great success. Although the hoped-for seventy examples of the marque was narrowly missed, a superb array of the Land Rover models, from the most early basic days up to the luxurious Range Rover versions of today with every imaginable fitment, was presented. In that 2018 model range the show was supported superbly by Likes Land Rover of Brecon and Hay on Wye, bringing their latest luxury models that, despite the gleaming paintwork and opulent interior, looked totally at home amidst the host of earlier models of deservedly proud owners from far and wide in the Principality. One of the furthest travelled was John Hughes and his family, who had journeyed down from Flintshire for the weekend in their bright yellow Range Rover P38 Special Edition model, one of only three in that original colour in Britain It's still immaculate despite having over three hundred thousand miles to its credit! Kenfig Land Rover Club arrived in strength with no less than nine Land Rover models lined up. The club, with over fifty members, regularly take part in ‘green lane’ trips and specialist shows. Included at our show were two impressive models from the RJ 4x4 specialists in Blackmill, a Land Rover 90 originally built for English Heritage in early 1985 and used to tow a mowing machine around the grounds of a Castle or two! The ‘90’ has since been fully restored, being the third such model off the Land Rover production line. The second was a Wolf XD military model, formerly used by 22 Regiment of the SAS, again fully restored but now with a somewhat less adventurous daily life! There were Land Rovers of almost every vintage, from the early 1960’s to showroom models, and types from Series 1 to gleaming Range Rovers, Defenders and Discovery models, the ‘workhorses’ not so immaculate but still prized and serving their owners in daily working life, along with ‘specialist’ models like the Sirhowy Motor Club specially equipped 2014 Freelander of Swansea man Martin Harry, a member of the Motor Sport Association Safety Radio Team, seen regularly on rallying events in Wales providing backup to both organisers and competitors in the running of the competitions and in any emergency situations. There were the amazingly modified models too, perhaps best illustrated by the Kenfig LRC short wheel base Defender named ‘Beastie’, fitted with massive wheels and tyres and raised suspension among its many modifications, such that there would be hardly any obstacle it could not overcome! Organisers were faced with a difficult task in selecting the ‘best in show’ from the host of the ‘Landies’ present, but – by an overwhelming margin – exhibitors and visiting public alike chose the pristine 1965 Land Rover SWB Series 2A of owner driver Paul Batchelor of Neath (pictured, right), his model restored to stunning condition in a five year labour of love, and a deserving winner. 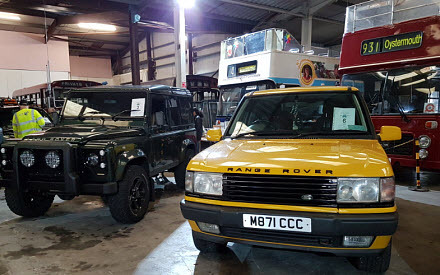 The Land Rover is pictured alongside the new Likes of Brecon & Hay Defender. Organisers complemented the show with trade stands that included paintings, models, and badge making by the Anni Ben Dod founder, who also has a ‘mobile potters and ceramics’ bus at the Museum. With the success of the seventieth anniversary display it is hoped that the show will become an annual fixture at our newly established Viking Way museum. New arrival: Wednesday 18th April saw a new arrival at the museum in the form of AEC Regent V 11 BWN, South Wales Transport 571. 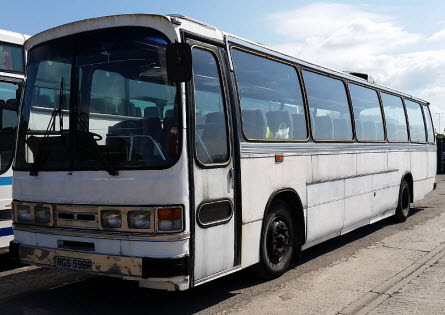 This bus has remained in the Swansea area for many years but had evaded inclusion in our collection until recent agreement was reached with her current owners, Pic-Up Spares, to move her to Viking Way for display and future running duties. The arrival means that all surviving intact SWT Regent Vs are now under one roof, making ours the largest collection of AEC Regent Vs in the UK, if not the world. Please tell us if you know differently! It had been intended for 571 to be on display at our February show, but fuel pump problems meant that she could not be moved in time. Some further remedial work now needs to be carried out to the gear linkage and internal trim before she is able to run with passengers - watch this space! For further information on 571's history, please see the Fleet page. Our Debut Show: The first event in our new home in late February promised to be nothing if not challenging. After all we had hardly had time to recover from ‘The Move’. Despite the many concerns, however, the day went well. Early snags were smoothly ironed out and the show blossomed in the sunshine we were blessed with. Some late arrivals ruffled a few feathers but apart from the fact that it was bitterly cold this was a day when we soared with the eagles. Most promising for all those involved in the organisation of the event was the fact that attendance was at least equal to the best figure at our old location, something that made all the effort behind the scenes worthwhile. 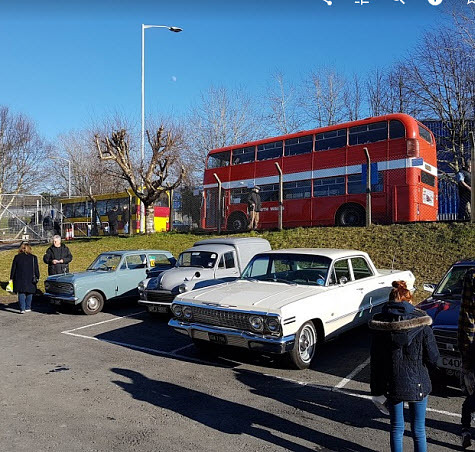 Thanks to the help of the Park and Ride folk, arrangements for parking at Landore and the transportation of people to Viking Way by heritage bus simply added to the day’s excitement for many who viewed the trip to the museum as an additional opportunity to travel back in time. With some wonderful good neighbourliness staff parking was arranged in the courtyard opposite and that too worked well. Our new arrangements for public entry directed people straight to our newly decorated reception area and many people, surprised by its professionalism, commented on how welcoming it all was. There were loopholes that were exploited before our official opening time, but they will be securely plugged for the next show. It seems that members of Swansea Historic Vehicle Register who had seen our direction signs believed they were pointing the way to their annual auto jumble. Arrivals and departures of operating heritage vehicles went smoothly with a selection of buses conveying people over a mix of routes. Popular among these were a number of newcomers. The first was a made-up Morriston circular which covered local communities. Also popular was an ‘up the old road and down the new’ excursion to Pontardawe with an opportunity to take photos of the village’s former South Wales Transport depot, a location more than familiar to many of our former SWT members. As for visiting vehicles, we had an interesting selection of buses. 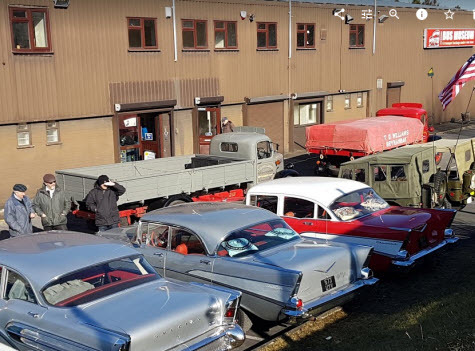 We were fortunate to welcome, once again, two of Mr Tommy Williams’ veteran haulage lorries, a number of military vehicles, Land Rovers and a glorious collection of eyepopping American cars. The variety of stalls was as good as ever although traders complained as bitterly as the rest about the cold. Most did, however, give a demonstrative thumbs up for our new home. All in all it was a tired but happy bunch of directors and hard-working volunteer members who wrapped up proceedings at the end of the day and above all else our debut show proved that we can successfully operate running days from Viking Way and that for the moment is all that matters. To all those who gave of their time and energy to make the day such a success the directors would like to say a huge THANK YOU for without such magnificent support none of it could have happened. As we head towards re-opening for our first show of 2018, it's worth reflecting on the tumultous time we've been through during the cold, wet winter months. Moving home is one thing, but moving a museum full of heritage buses offers a completely different challenge as we all found out in the run up to Christmas. That we succeeded in vacating our former home just off Fabian Way on the last day of our tenure there was nothing short of miraculous. That’s not to say that our small band of volunteers weren’t working flat out for what seemed like endless days in the run up to Christmas. What a time it was, Christmas for a start then an alternate battle of the weather gods. In the middle of our endeavours it was either freezing cold or pouring with rain. As many will know and understand, it had taken a great deal of administrative effort to remove a lot of vehicles and vehicle parts that basically weren’t ours from the building. Once this was done at least we could begin to see the wood for the trees as they say and discover just how much junk had been abandoned at the back of our building and for which we were paying rental space. The weight of some of these parts from long vanished buses was enormous. To move them took a great deal of time until the arrival, one damp November morning, of a real of a beefy, four ton, high lift fork truck. The vehicle rolled smoothly off the back of a low loader which had delivered it from South Wales Fork Trucks of Crynant. Proprietor Brian Selby had become aware of our logistical problems and offered free loan of the vehicle for a couple of weeks. As it happened and thanks to the company’s generosity the yellow peril was with us for far longer. Make no bones about it without the assistance of SWFT, Brian Selby and hire manager Neil Melbourne we could not have achieved our move on time. So thanks a million, guys. 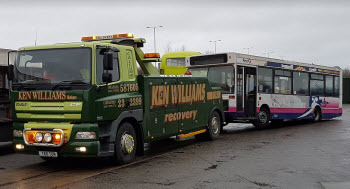 The same company also topped up their assistance by providing a low loader to transport a number of buses from the old premises to the new. Unfortunately we were only able to move two vehicles this way because the construction of more modern vehicles prevented their safe loading. The two that this vehicle did move was a great help. The title of first bus into the new premises actually goes to our Mercedes L608D which hitched a ride unexpectedly one Sunday on the back of Mike Kidwell’s lorry. The first operational bus to arrive at Viking Way was Kristian Davies’ stepless Dennis Dart, a couple of bits of info for whoever comes to write the archival adventures of life at Swansea Bus Museum. Once vehicles started arriving at the new museum it became a case of getting them inside and out of the weather as quickly as possible. One of Mike Kidwell’s collection of Land Rovers gave an excellent demonstration of the vehicle’s abilities as it fulfilled this task. Also useful, but this time something that came at a cost, was the raising of the main entrance doorway. There was an air of excitement when this was lifted for the first time. The temporary ramp to the door provided by vintage JCB owner Ian White, again constructed in torrential rain assisted matters and hopefully will continue to do so for some time. With every vehicle that arrived inside the building concerns grew about whether we would get everything in. The last vehicle to leave Fabian Way was Huw Morgans’ Bristol VRT open topper. And yes it made it inside the new museum with room to spare. When the dust settles vehicles will be rearranged in order that they may be displayed for maximum effect. As Christmas and our New Year’s Eve deadline to evacuate Fabian Way loomed it was obvious that we would need to seek some extra help. Eventually again on another dark and damp December morning this appeared in the form of an immaculately turned out vehicle complete with skilful driver and operator from the Ken Williams breakdown company. That same day three vehicles were taken to the new museum followed by a further three in following days. The request for help had been sent to Ken Williams at very short notice and the fact that the company was able to respond in such a magnificent way was another one of those miracles that brought a huge sigh of relief from the few volunteers who had almost permanently been in the museum throughout December. However everyone who put in an appearance played their part in making our move possible. Apart from the big stuff there was an absolute mountain of peripheral bits and pieces, from the canteen kettle to high level step ladders, that needed moving at one point or another. When that was done the task of sweeping out began to rear its ugly head. In the beginning there were few brushes. When the chairman closed the doors for the last time there were a great many, so when the floor needs sweeping in future there’ll be a brush for everyone. When everything had been taken from Fabian Way the empty space that remained was amazing and prompted more than one member to comment that it would be big enough for a bus museum! Eventually, as the doors were locked for the last time there was no doubt that there was sadness in some hearts, but everyone will soon warm to our new home. Strangely, two days later on yet another damp and misty morning, the chairman, secretary and treasurer were back in the old building. This time it was for the official handover and final meter readings. Fortunately the landlord was happy with all that he saw and, after smiles and handshakes all round, your officers breathed a huge sigh of relief! December 2017: The museum is CLOSED while we move to our new premises on Swansea Enterprise Park. Our new site will open in early in 2018. Further details will be published nearer the date. 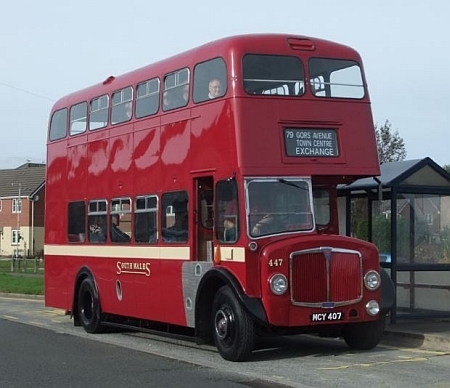 Our grand old lady 447, the oldest surviving AEC Regent V is always an attraction for visitors, but her popularity is likely to hit new heights as she takes on the role of TV star. The vehicle owned by museum chairman Alan West was used in filming for a new series about to hit our TV screens. Filming took place around the sweep of Swansea Bay ending at Knab Rock car park on what must rate as the sunniest day of the year, way back in May. The series, featuring comedians Elis James and Miles Jupp and perhaps appropriately called James and Jupp, starts this Sunday 22nd Oct at 7pm on BBC Two Wales, with another showing on Tuesday 24th Oct at 10.45pm on BBC One Wales. It will also be on BBC iPlayer. Our episode is the third one, so will air on BBC Two Wales at 7pm on Sunday November 5th, with a second showing at 10.45pm on BBC One Wales on Tuesday 7th November. The dawning of Sunday, October 29th will not only herald our final running day of 2017, but the start of a new era in the annals of Swansea Bus Museum. For immediately the doors close on this event the museum will close for the winter and preparations will get underway in earnest for our forthcoming move to our new home in Viking Way, Winch Wen. There will be many appeals for help in this process, so we hope we can count on you to lend a hand and spread the load. 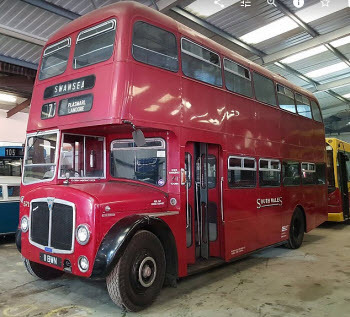 Moving one heritage bus can sometimes prove difficult, but relocating a museum full of them is about to present us with a mammoth challenge. 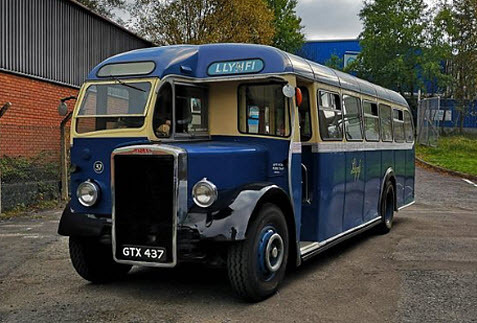 Swansea Bus Museum is planning to relocate its collection and displays as part of a major development plan and that means a huge logistical task for its small, but dedicated, band of regular volunteers. Before the end of the year the museum will leave the former industrial building in Swansea’s SA1 Business Park that has been its home for many years and relocate to a modern property in Swansea Enterprise Park. The move comes as the lease on its current home ends and the museum seeks to expand its road transport restoration and preservation activities into the future as well as improving facilities for the storage of its unique collection of vehicles and also those for visitors and educational purposes. The move will allow for the creation of much needed facilities which will assist the museum in growing into a fully accredited tourist attraction. Chairman Alan West, one of those who have helped nurture the museum from its early beginnings, welcomed the move along with the wide-ranging future opportunities it offers. 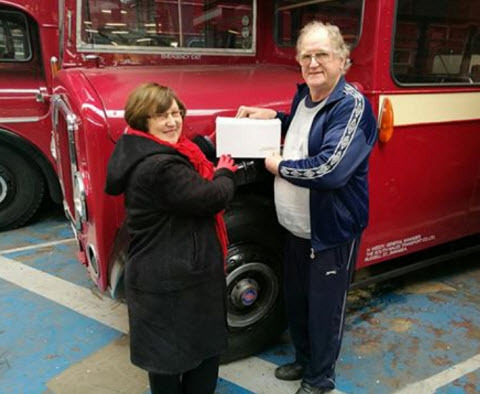 “We have an important collection of vehicles at Swansea Bus Museum and the move will allow us to extend this as well as creating a more welcoming environment for visitors who are very important to our survival. 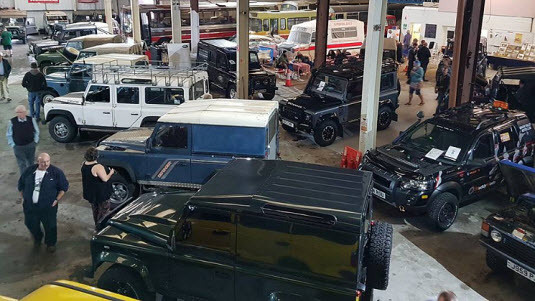 “There is no doubt the transfer of our collection will present an array of problems particularly with vehicles awaiting restoration and heavy or bulky parts in our stores. The logistics are a nightmare and we are hoping that our predicament will attract some favourable support from at least one of our local haulage companies. “Interest in the museum is on the increase both with volunteers and visitors. Shortly we will be welcoming a party of transport enthusiasts from Ireland keen to view our collection and others are set to follow. Members want the museum to grow and provide an additional point of interest for visitors to the city. “The move is a mammoth task, but one we are confident we can achieve within the timescale and hopefully with a little help from local companies,” he said. The museum houses a range of passenger transport vehicles. Among them are a number of rarities like the oldest surviving AEC Regent V and the world’s only AEC Regent V single deck vehicle, built to tackle low bridges in Llanelli’s New Dock area. The move will take place in the run up to Christmas, but in the meantime the museum is organising a farewell running day at its current site at SA1 Business Park, Langdon Road, East, Swansea, SA1 8PB, on Sunday October 29 from 10am to 4pm. Further information can be obtained from David Roberts, SBM Secretary. Tel: 01792 732832. Making its debut operating the Park & Ride shuttle during our February Running Day was the latest addition to our collection - a Leyland Tiger, registered DFP 492Y. It was new in May 1983 to Trimdon Motor Services of County Durham and registered BAJ 637Y, complete with Plaxton C49FT bodywork. Following several changes of registration - 2090 VT, DFP 492Y, MIA 2082, YOI 13 & DBZ 918 - it passed to Andrews Sheffield Omnibus. 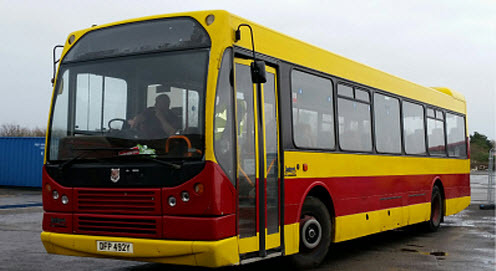 Having been acquired by Strathtay in September 1999 and rebodied by East Lancashire Coachbuilders, the Tiger returned to service as fleet number 427 in May 2000 with EL Myllenium DP49F bodywork. Based at Dundee for much of its new life, it was renumbered 25815 and painted into Stagecoach livery following their acquisition of the Traction Group in 2006. Re-registered as DFP 492Y, it was sold to Woottens of Chesham in April 2008, before passing to Cresta Coaches of Alresford, Hants in 2014. 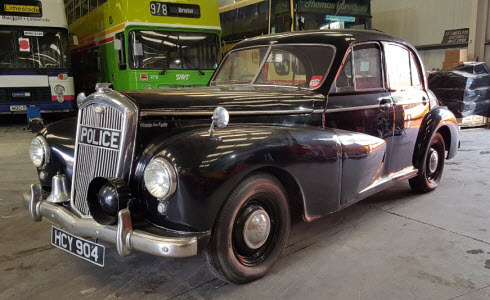 It was purchased by one of our Trustees in fully MOT'd and running condition in February 2017. February 10th: We were recently delighted to welcome a particularly generous visitor. Seen opposite with museum chairman Alan West, Pamela Davies from Pontyclun had dropped into the museum with a special donation. It was a collection of 600 photographic slides taken by her late husband David between the early 1950s and the late 1980s featuring buses in and around Swansea. The slides will now be added to the museums growing collection of artifacts depicting the city's colourful transport past. Alan said: "We're delighted with the generosity of Mrs Davies and know that the images caught on her late husband's camera will play an important role in recalling the past." During 1976 Bedford chassis, numbered FW454711 was built at the plant in Boscombe Road in Dunstable. It was a standard 11 metre chassis. It then went to Tricentrol Chassis Developments at Skimpot Lane, Luton. There the chassis was cut just in front of the rear axle and a plate fitted: this extended the wheelbase by 18 inches while a further 18 inches was added to the rear of the axle to enlarge the boot. It then went to Duple Bodybuilders of Vicarage Lane Blackpool, where a Dominant II body, number 679/7300 was fitted. In September/October 1976 it was displayed in the demonstration park at Earls Court for the Commercial Motor Show (pictured below). It is not known on who entered it as the catalogue does not provide this information. 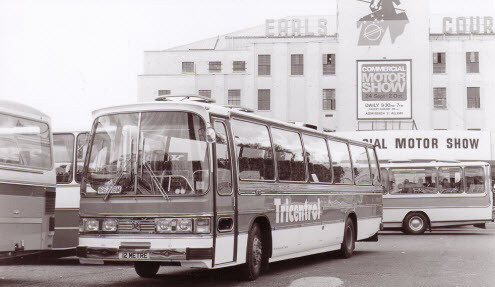 After extensive testing during the next six months, it was registered RGS598R and placed into service on 1 April 1977 by Tricentrol Coaches Limited of Tavistock Street Dunstable. It spent the next five years in service with Tricentrol, operating various coach services including some operated in conjunction with National Express. In May 1982 it was purchased by Eagre Coaches of Morton near Gainsborough in Lincolnshire. It remained with them until May 1995 when it was bought by Spratts of Wreningham in Norfolk. It was bought in 2002 for the sole purpose of driver training and the obtaining of a class D licence. 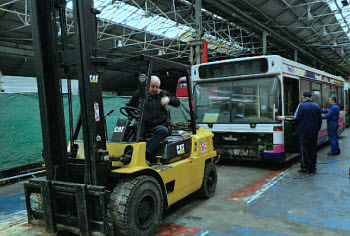 The vehicle is currently being restored to its original colours as it was with Tricentrol Coaches. This task has been greatly helped by the recent acquistion of a colour picture of it in Tricentrol livery. Up until this point all photos in my possession were black & white! As advertised on our home page, our October 30th show will take place at the museum as usual. Please be aware that, due to having a new new neighbour, the layout of the area immediately to the front of the museum has changed, while there are also several new storage containers just beyond the museum. Visiting display vehicles will still, however, be able to park in the yard beyond. It is imperative that show visitors arriving by car use the free Fabian Way park and ride facility from where a free shuttle bus will operate to the museum throughout the day. On-site parking is available to blue badge holders only. We are well aware that many car owners "try it on" but their selfish behaviour inhibits our ability to run bus services from the site and poses a real risk to public safety. As our building lease now has another 15 months to run, we expect to hold our 2017 shows on site, but the situation is being kept under review.